Big Hungry Shelby: Summer Date Night 2016 Shored Up! Summer is officially here, and gentlemen, I’m writing directly to you — I bet a waterfront, sunset-soaked date night is expected of you in the next month or so. You’ve probably already taken your lady (or your fella!) to Sackets, Clayton and the Bay, so where else can you find spectacular views, refined food and loads of ambiance? Look to tiny Morristown in St. Lawrence County. This diminutive village has a prime panorama of downtown Brockville, Ontario, from across the shimmering late-day waters of the river, along with Ella’s on the Bay, your new gourmet clubhouse and date night secret weapon. Do you want an upscale night out in a polished setting, air conditioned and overlooking the water? Ella’s has got you. Feeling more casual, craving sunshine and sandwiches? Yup, it has that too, by virtue of its waterfront deck complete with colorful umbrellas. 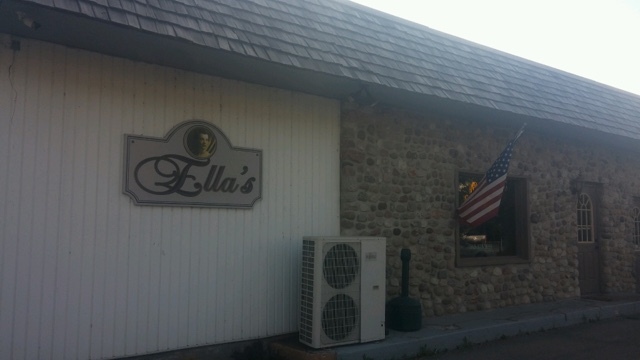 Ella’s even has a large bar area, separated from the dining room entirely, so you can cut loose without suffering dirty looks from the next table. This place might just be your perfect summer night out. But enough buttering you up — I need to tell you about the food! As soon as we were settled in, we dove into the menu. It included varied and inventive appetizers, fine dining entrees, quite a few tasty-sounding sandwiches and even pizza. We chose the pan roasted Brussels sprouts ($8) to begin our dinner. Before the sprouts arrived, our expert and jovial waitress, Rhonda, brought a round of drinks in glassware etched with the restaurant’s name. The cocktails were expertly mixed — strong but balanced. We relaxed and took a look around the attractive dining room, with its stacked river stone fireplace facing a wall of windows framed by dark-stained wood moldings and lit by modern, industrial lighting. 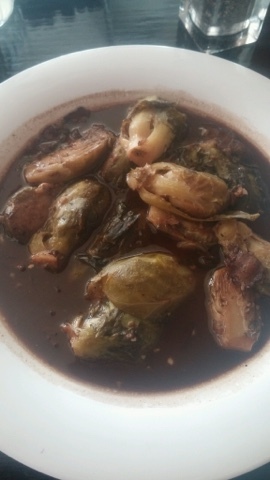 The bowlful of Brussels sprouts was amply dressed in balsamic vinegar and butter, with garlic and bacon adding depth to the cabbagey funk of the vegetables. The vinegar was the star of the show, sweet and sour at the same time. Our salad course was made special by absolutely stunning homemade ranch and honey mustard dressings. 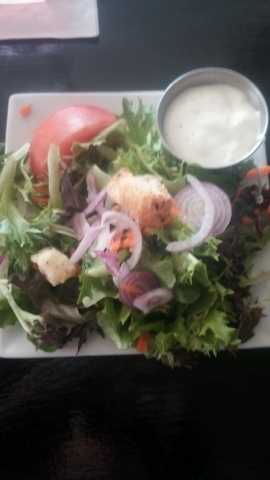 The honey mustard was sweet and hot, delectably thick over impeccable baby greens, house made croutons, cucumber slices and tomato wedges. The ranch was the most flavorful, thick version I’ve ever tasted — garlicky and well-seasoned with both herbs and salt. I would go back and order a dinner salad just for that epic, awesome ranch. I want it on fried chicken sandwich, as a dipper for fries, and to eat from a spoon. I have no shame. 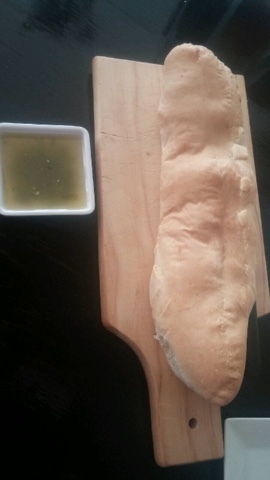 With this course came a skinny baguette of soft, light-as-air, housemade French bread served with a fresh basil oil chock full of the assertive, bright herb plus lots of fiery, finely minced garlic and shallots. I am not usually one to fill up on bread, but it was very difficult to stop cutting off thin slices of it and dunking them in that bodacious, herbaceous, addictive oil. This item, as well as the dressings, are wanton things, and may cause you (or your date) to suffer the loss of some inhibitions. You’ve been warned. Saturday night at Ella’s is prime rib night. The queen cut ($22), ordered medium-rare, had the most velvety texture I have ever had when eating this meat in Northern New York. Each bite succumbed after just a couple of chews, melting away into delicious beef flavor. The small cup of au jus served alongside was robustly fatty and beefy — the juices from the roasting of the rib not strenuously separated out from its fat, but allowed to mingle and imbue the sauce with a slow-cooked, well-developed depth. 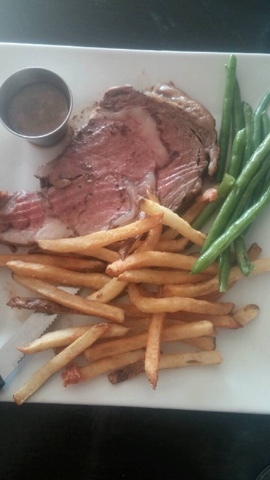 That au jus was not only a perfect accompaniment for the meat but also for stray bits of bread that somehow survived my oil-drowning attempts and gaping maw, as well as the hand-cut fries ordered with the prime rib. The fries were lightly sprinkled with kosher salt and had excellent flavor — not taken so far in the fryer that they were super crispy, but wonderful and somewhat more blond than most from-scratch french fries. A side of steamed, slender green beans, the vegetable of the night, still retained their bright green hue and a crunchy interior. They were yummy dunked in the jus, too. We had basically abandoned all sense of propriety during this meal, and were dunking everything in all sauces available to us. I suggest you follow suit when you visit. 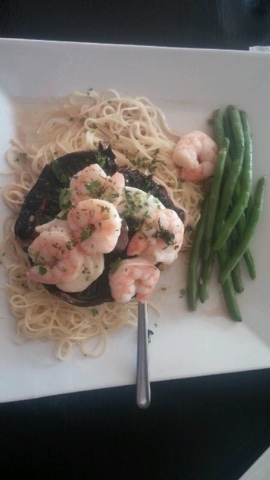 Kicked-up shrimp scampi ($25) arrived as a crown of six perfect, pink shrimp sitting atop a lily pad of a portobello mushroom with a little fresh mozzarella thrown in for creaminess. That grilled portobello was perched on a nest of angel hair pasta dressed in a Chablis and butter sauce. You don’t see a lot of Chablis wine used in cooking anymore; it has a citrusy finish that works nicely with the meaty earthiness of mushrooms and the sweetness of plump shellfish. This was a complex dish that was executed well — these are not flavors I’m used to enjoying together, and their individual personalities were both interesting and delicious as one. The only criticism I would lob at this creation is that it could have used a bit of crunchy texture — a spoonful of breadcrumbs toasted and sprinkled on top would have added even more intricacy and interest. 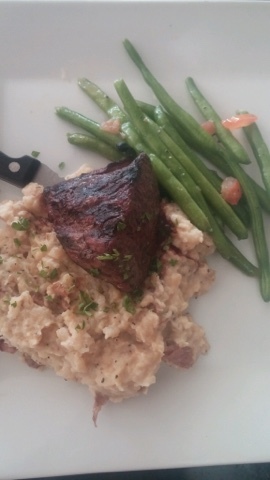 Ella’s filet ($26) was crusted on the outside and well caramelized either on the grill or under the broiler. The inside was wonderfully tender, cooked as the diner had ordered, medium-well. It was served with smoked Gouda-smashed potatoes, prepared skin-on, which were creamy and absolutely shouting out the vaguely meaty, smoky lushness of that cheese. Smoked Gouda has so much personality, you don’t need much else going on, and it helped makes these potatoes irresistible. The smoked flavor of the cheese was especially brilliant with the steak, its own smoky, grilled notes pairing perfectly. The filet is offered with grilled onions and mushrooms on top, which would undoubtedly add sweetness and woodsy depth to the dish, but our diner chose not to add those. The portions were just right — hearty enough to fill you up and justify the price, but not so big that you were groaning with fullness and unable to consider dessert. Indeed, we had been scoping out massive slabs of strawberry cake delivered from the kitchen to tables around us and hoping there would be a slice left for us when it was time. 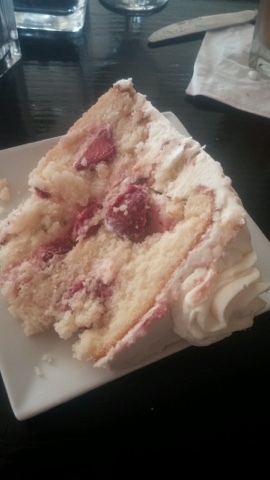 The dessert gods smiled down, and Rhonda secured us a piece of strawberry cream cake ($6). A bite of this layer cake was like a mouthful of wild strawberries wrapped in a fluffy cloud of sugar, or in this case, moist angel food cake with a crumb so tender, the pastry chef may very well have been trained in the heavens. Whipped cream separated the layers, and ruby red chunks of fresh strawberries were moored in the cake, tumbling free with each forkful of the fall-apart delicate dessert. The buttercream frosting wasn’t overly sweet — it wasn’t quite as tart as a cream cheese frosting, but creamier and less sugary than most. 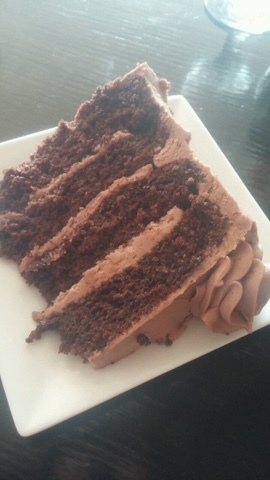 Chocolate layer cake ($6) was perhaps more ordinary than its fruity compatriot, but no less decadent. The fudgy cake was rich with eggs, denser than the white cake, but no less moist. The chocolate buttercream spread between the layers and over the top faintly crunched with sugar crystals — a pleasant textural treat. 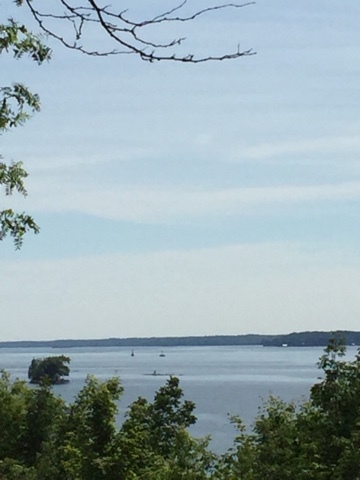 Morristown is a village marked by flat rock and granite outcroppings, like much of the St. Lawrence Seaway. Ella’s on the Bay smooths out some of those rougher edges, a soft spot to shelter, be pampered and revel in cuisine you wouldn’t expect to find in an ancient settlement that witnessed shipping battles in the War of 1812. Quite simply, we felt like we had unearthed a treasure few others knew about, even though the small dining room and bar were bustling that night. Dinner at Ella’s ran $131.76 for three, with four cocktails, one appetizer and two desserts. We enjoyed lively banter with Rhonda, gazed over the river at Canada — which is so close it feels like you might be able to reach out and touch it — and delighted in every food and libation. This is an enchanting dinner spot, and I imagine a repast on its sunny deck or in its lovely bar is, as well. I award Ella’s on the Bay a nine on the Big Hungry scale. 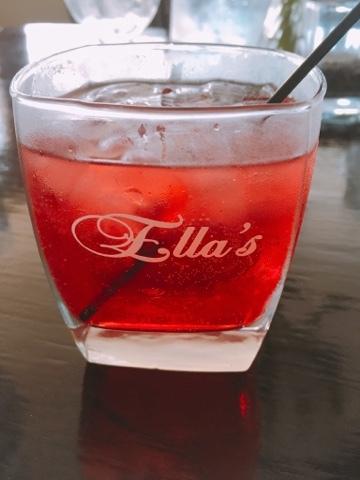 The next time you want to treat your beloved to a refuge on the water, celebrate an anniversary or graduation or just get away from your normal evening haunts, consider Ella’s. She’s all set to captivate you and your significant other and tick all the boxes for your perfect summer date night. My personality is big; my hunger is bigger! I would totally go there and dip everything in all the things. This entire meal is right up my alley (the ranch, prime rib, and strawberry cake in particular). This place is garbage, I wouldn't eat there again if I was paid to. Took 15 minutes to just get our drinks. My cheeseburger was burnt, and my friends lobster was rotten. Smelled like something my dog would roll in. Absolutely disgusting, and the owner is a real JERK. Wouldn't recommend to anyone. I'm sorry to hear that; obviously, that wasn't the experience we had, at all. 15 minutes doesn't necessarily bother me as a time period to get drink, personally, but the lobster being bad is not ok. Did you send it back?